Tank you for the Car. I just received. I am very, very happy. Thank you. Soon I will ask for another. Thanks very much for the excellent automobile services you have provide. I have just purchased my Subaru Forester which arrived two days ago on board South Islander. I have examined the car and very astonished to find it in a very good condition. I am delighted to inform you that I have finally received my vehicle which arrived on time. Thank you very much to"Trust Co." for the trust that i have placed with and that has evidenced through the successful receipt of my order. It was a great buy and I am really enjoying driving it. Certainly, I will recommend to others of "Trust Co." and its reputation. Many thanks to you and trust company for the vehicle M/Rosa I bought from you. I received the vehicle in good condition. I would like to take this opportunity to inform you that a car has been arrived safely at Dar es salaam port on 16 February 2013 and it has been already taken from the port to my home. I have been informed that the car is in good condion. To this end, I would like also to thank you for your understanding and cooperation for the entire period of doing business with you. I hope we will do business again in the future. Good day sir, I have received the vehicle and it is in a very good condition. Thank you for the service rendered to me and for the quality of the vehicle from the company. May you prosper in the business and I will be doing business with your company in a very short while. We have finally collected our vehicle its quite awesome and we are grateful for having assisted us in procurring this marvellous gift. We shall be in touch in the near future for another one. I wish to inform you that i received my vehicle in good shape just like i saw it on your website.Its in perfect condition,the engine is intact and produces good sound.I am very happy with the services you offered me during the whole transaction process... I would definitely recommend you to others. seeing. Thanks. I cant waint to start driving. Best regards. I am doing well here.This is to inform all of you that my car Nissan arrived safe in Tanzania without any problem.It is a nice car and I really like it. As your name ( TRUST COMPANY ) You are TRUSTED and I will be your Ambassador to tell the people about your company -Very clear, Transparent and very fast doing things. I thank all of you in Japan as a Company and also your department I deal with:. 1 - Sales department ,2 -Shipping department 3 - Victor Shakwe at Japanese Vehicles Dar es salaam .He is nice person ,He work very hard and he cares about his customers . I like the way he works Thank you Victor . Thank you once again and wish all of you a wonderful day. Inform the entire staff of trust company that my vehicle is finally at Home and vehicle reach with good condition and i hope the trust name came as true as you name it, i will remain your customer for ever in japan. let the name of trust remain as its name. i hope me and my kid will enjoy that car with God is care and let God bless your company once more for the trust you build with your customers. in very good Condition, I now enjoying driving in Dar Es Salaam city. I hope you are all doing good out there. This mail serves to inform you that my vehicle -TOYOTA OPA has been collected in Dar es Sallam on 30 th Jan 13. However,i am really convinced by the services rendered by your Company especially Miss YUKI and Miss Tokuda. Your assistance from the beginning of our conversation up to the last step has proven good work far much beyond my expectation. You all deserve an appreciation for the job well done.My car is in mint condition . The car is just like the same as seen on the photos,no scratches or dents on the body.The communication was excellent and i was being updated in every step until the vehicle was shipped. 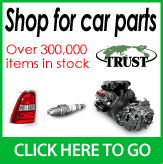 I would recommend my fellow customers to buy vehicles from TRUST COMPANY. I have received my car today, it is very good and drives good. Thank you for your coorparation. i hope next i will do business with you agaian. I acknowledge receipt of my vehicle here in Port Moresby - PNG. The car [...] Toyota Estima. I took the car home on Wednesday 23/01/13. The car is in good condition, which is worth the money spent. I take this opportunity to thank you and the professional sales and marketing team in your company. As a local agent vehicle dealer, last year I purchase vehicle from Trust and also purchase vehicle from beforward. I compare that quality vehicles comes from trust that is this year I want to remain with trust company. I just wanted to let you know that I have just received my Suzuki Swift which I ordered from your Company. The Car is really good and I really love it its in immaculate / showroom condition and very good condition indeed. I am also planning to order more from your Company. Thank you very much for your kind assistance.